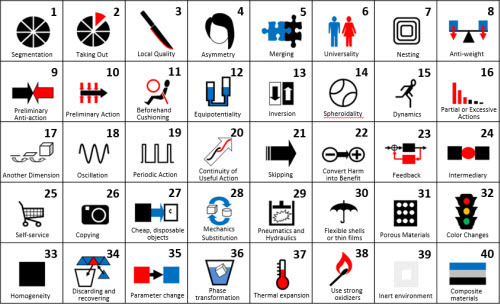 There are 40 TRIZ Inventive Principles. Here we cover 1-8 of the principles. Segmentation transfers a complex task into a number of simpler tasks that are easier to solve. 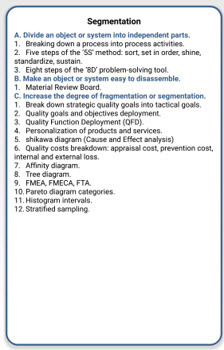 From very simple but effective tools like Pareto analysis (fig 1) to very complex tools like Quality Function Deployment (fig2). 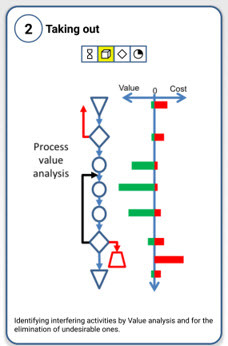 Perform a value analysis of each process step. 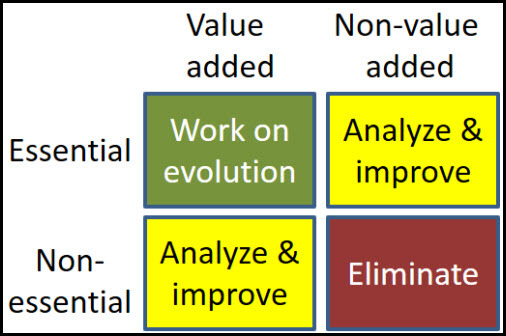 Determine the created added value and the costs to achieve that value for each step. 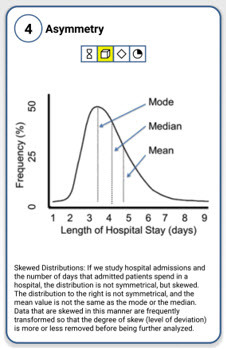 Using the inventive principle ‘Taking Out’, eliminate the non-essential activities with no added value and those with high costs. ‘Local Quality’ means to single out a specific object (i.e. 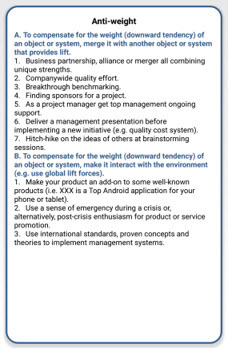 product, service, processes, process activities or tools). 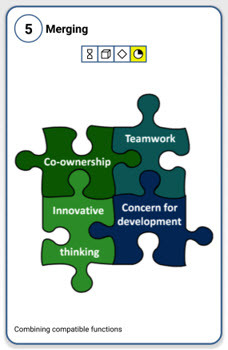 Then improve it to better provide its function or place it in an environment so that it is optimally useful. 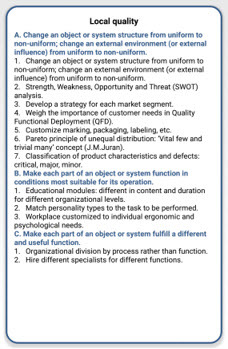 A House of Quality Matrix aids in defining a product to meet customer needs. 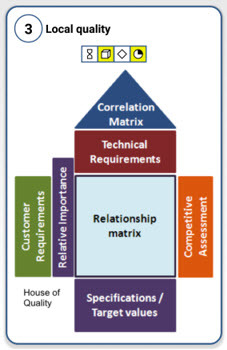 It help defines the relationship between customer requirements and the product capabilities. It lays out the target parameters to make the product appealing to the customer and surpass the competition. 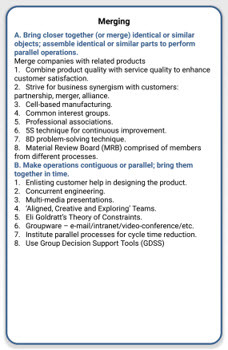 This tool fosters teamwork during design and process planning operations. Symmetric solutions might be more appealing to the human eye, but occasionally asymmetric solutions might provide better functionality. 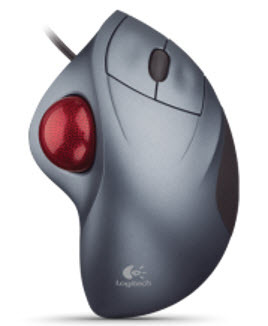 This Logitech TrackMan Wheel Mouse with an asymmetric, right-handed design mouse is better suited to be used by a right-handed person but is almost unusable for a left-handed person. The principle of merging or combining means bringing together things which happen at the same time or in the same place. 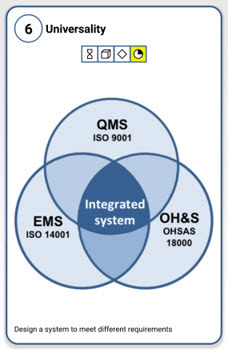 For example, when designing QMS, several tools can be combined into a powerful method. An element of the QMS is corrective action. 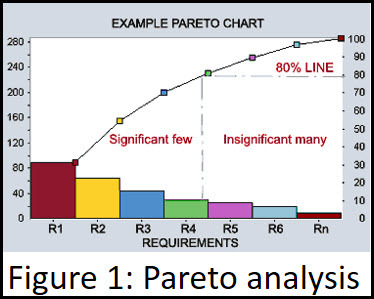 use the Pareto analysis to separate vital problems from the trivial many. 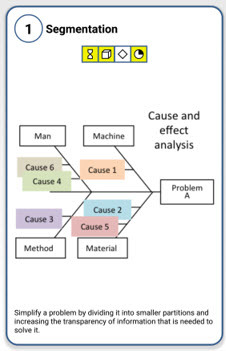 Use a tree diagram to define the corrective actions and the corresponding resources needed to implement these corrective actions. The inventive principle ‘Universality’ is used where objects can perform multiple functions. It is particularly useful where an object can be eliminated by having another object perform the same function. 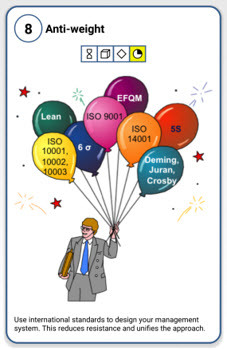 For example, when integrating ISO 9001 and ISO 14001 requirements there are a number of procedures that apply to both standards. 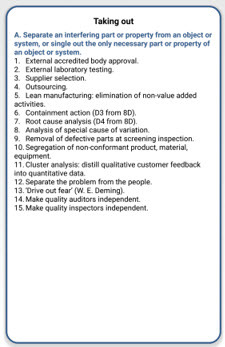 corrective and preventive action procedure. Nesting means putting one thing inside another. 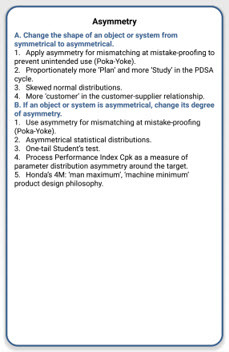 In management systems PDCA loops are nested so that there is a strategic PDCA loop with a one-year period and operational PDCA loop with a one week/month period. 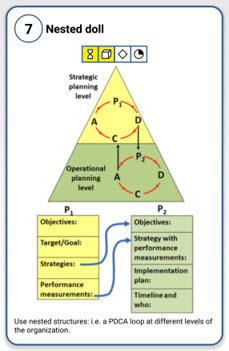 Management processes are nested: the Sales Management process is nested in the Product Marketing Management process which in turn is part of a larger Strategic Management process. Use Force Field Analysis to find which force causes the shift towards an undesirable direction, then apply a compensating force to steer the system in the opposite direction. 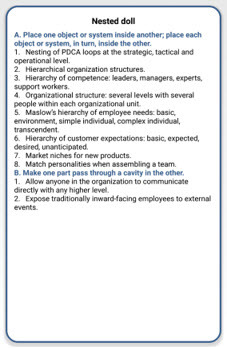 Merge companies to take advantage of the other’s stronger capabilities. 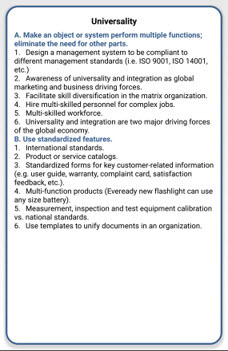 Use international standards to set up requirements for a quality management system.